If you’re looking to cut the grass on the cheap, protect the environment, and get rid of all those annoying spark plug changes, an electric lawnmower may be the key that unlocks the door to a better looking and more hassle-free yard. In this post, we’re going to take a look at the best cordless electric lawnmower that fits your situation. We’ve already covered the best corded electric lawnmowers and the best electric lawnmowers in general, so we’re going to be pretty specific on this post. We’re going to help you find the mower that’s best for you. So with that said, let’s take a look at our top pick. The Snapper 19-inch comes with a load-sensing technology: it can detect how much power it needs to mow your grass and adjust its output. This helps save your battery, but the 45-minute battery life will be drained faster on taller or thicker lawns. Snapper’s mower comes with options to bag, side-discharge, or mulch your grass. We discuss the benefits of each of these options down in the Q&A section, so for now, just know that the Snapper can be customized to get your yard to look how you want it to. One possible downside here is that the bag isn’t very big, so you may need to empty it quite often if you decide to bag your grass. At 21 inches, the Greenworks Pro has a wide cut diameter, meaning that you won’t have to make as many passes around your yard to cut all the grass. 2 batteries and a rapid charger are included. The specs on the batteries and charger are about the same as the Snapper: each battery should last you the better part of 45 minutes and the charger can charge the batteries in about 30 minutes. Another feature of the Greenworks Pro is the load sensing technology. Your mower will be able to detect when it needs to amp the power up or scale the mowing down, making sure that you aren’t using too much battery for what you need. Another point for this mower comes in the fact that it too can side-discharge, mulch, or bag your grass for you. It has 7 levels of height options ranging from 1-3/8″ to 3-3/4″, so this mower allows you to customize how you want your yard to look. This mower packs a punch and it has a larger cut diameter than many other options, but that power comes at a price: this thing is heavy when compared to other cordless electric mowers. Dual blades offer better cut quality, superior mulching and bagging capabilities; 5 position single lever height adjuster allows for a cutting height range of 1-3/4" to 3-3/8"
Greenworks makes the list again with one of their products that’s a little bit more budget-conscious than the Greenworks 21-inch we reviewed above. When buying a cordless electric lawnmower, one of the biggest factors in price is the battery that is included with the product. 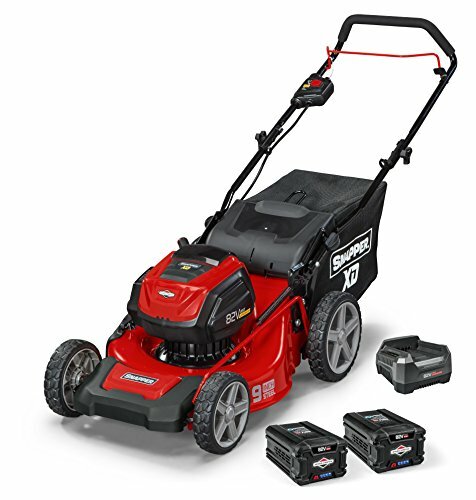 This mower helps those who are looking to get a great mower at a quality price by including one great battery and one that is so-so. The great battery (4 Ah) will last you up to 45 minutes. The so-so battery (2 Ah), up to 25. This mower comes with smart technology that can sense when it needs to amp up the power to get through your grass, so your mileage may vary depending on whether or not you’re sporting a small Amazon Rainforest in your front yard. The fast charger is included in this mower as well, so if you burn through the 45-minute battery, you can have it at almost full charge by the time you finish with the 25-minute battery. This mower has a neat feature that you can insert both batteries at once and it will switch to one battery after the other is depleted. This is a nice feature, but if you have a larger yard, we recommend starting to charge the depleted battery ASAP after finishing it. One area this mower lacks in is cutting options. It has options for mulching and bagging, but no side-discharge is included or available for purchase. You can detach the bag to shoot grass out the back of the mower, but some may not like grass getting on their legs and feet. The mower has 5 positions for cutting height, ranging from 1-3/4″ to 3-1/2. This mower is a great option for those who are looking to get the biggest cut diameter for the fewest dollars or for those who want a light mower that is easy to maneuver. This mower is small, clocking in at just 42.5 pounds, so it is possible that this mower has been stored in the Toy section of a Walmart by accident. A 4-year warranty is included on the mower with a 2-year warranty on the batteries and charger. 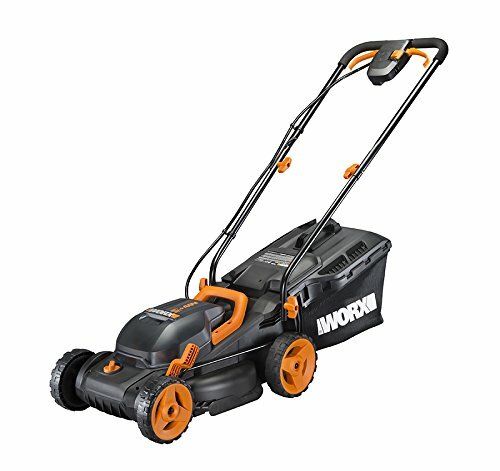 This is a great mower for anyone who is wanting a lighter option or for those who want to get a lot of bang for their buck, but don’t mind sacrificing a bit as far as battery life goes. EGO Power+ went out of their way to create a mower that could chomp through some thick grass. Their mower is 20 inches, but does a good job of cutting through thicker grass. EGO Power+ claims that this is due to proprietary battery technology. Their voltage (voltage usually equals power) is lower than the first 2 options we reviewed here, but many buyers say that this mower does an excellent job on thicker grass and that the battery lasts longer than normal before needing replacement. 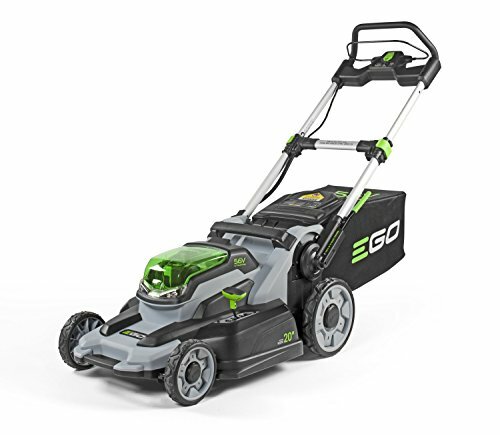 The battery included with the EGO Power+ is a stout one: 5 Ah will allow you up to about 55 minutes worth of cut time, but this mower isn’t equipped with load-sensing technology, so it will go full speed ahead the whole time, draining your battery faster. A rapid charger is included and will get the charge done in about 30 minutes, but this mower comes with the 1 battery, not 2 like many other mowers. This mower does allow you to side-discharge, mulch, or bag your grass. It has 5 height adjustments ranging from 1-1/5″ to 3-1/2″, so this mower comes with plenty of options to customize your yard look. This mower weighs in at about 56 pounds so it is on the lighter side of cordless electric lawnmowers, so it will be easy to maneuver and store. It’s one of the pricier options, but it comes with a battery that is more powerful than usual and this mower includes long warranties: 5 years for the mower itself, 3 years for the battery and charger. This is a good option for those who want to know for a fact that their mower will last a long, long time. Overall, this is a good mower if you are looking for an extra powerful battery, want to know for sure you can get through thick grass, or want long warranties for your mower. The Worx mower is our top pick if you’re looking for a mower that is lightweight or very budget conscious. This mower is small: it has a 14-inch cut diameter, but this little fella packs a punch. The Worx comes with the option to run your mower with or without “Economy Mode”. If you decide to go without Economy, expect lower battery life, but this mower will be able to get through the thickest of grass. If you do run your mower in Economy Mode, you can expect up to about a 40 minute lifespan out of a battery. 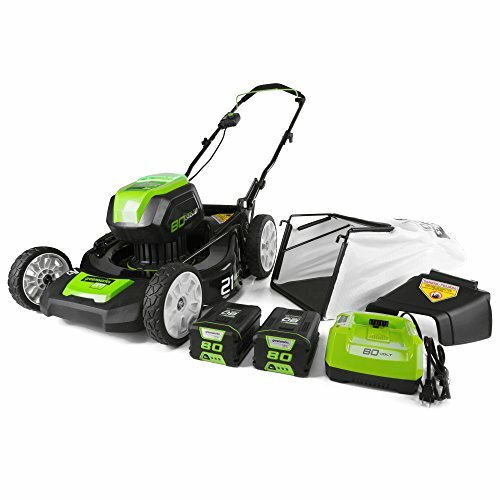 This mower includes 2 batteries and a non-rapid charger that can charge both batteries at the same time. Since the charger isn’t a rapid charger, you can expect that charging your batteries will take the better part of a few hours. This mower does come with the option to mulch or bag your grass, but a side-discharge option isn’t included or available for purchase. As mentioned before, you can remove the bag, but you may not like getting grass clippings on your legs and feet. It comes with 3 mowing heights ranging from 2″ to 3-1/2″. This mower is the lightest of the light, weighing in at about 35 pounds, so it can double as something made by Fisher-Price. The handles fold for easy storage. This mower comes with a 2-year warranty on everything. It’s best suited for small yards or yards that are difficult to maneuver. This mower will be a good option for you if you need a very light mower that’s easy to move around and store or if you are looking for the most budget-conscious option available. 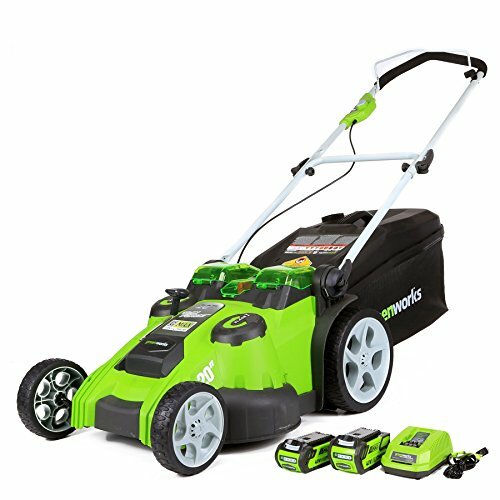 What Size Electric Lawnmower is Best for My Yard? If you didn’t notice, cordless electric lawnmowers come in a wide range of sizes from 14 inches all the way to 21 inches – over half a foot difference! In general, the smaller mowers are more suited to budget buyers. It is worth keeping in mind that the bigger the mower, the fewer passes you’ll have to make through your yard. Here is a little chart that may give you an idea of how big of a mower you need. The cut width is in centimeters. Over the course of a few years, you may end up saving yourself a good bit of time and money with a larger mower. Larger mowers are not always better though. If your yard has a lot of natural areas, koi ponds, raised gardens, turns, corners, or a lot of other things that will need to be mown around, a larger mower may end up causing more trouble than it’s worth. Smaller mowers are always easier to maneuver and a lot lighter when you’re turning. In some brands of mowers, the battery is the biggest distinguishing factor between mowers, so it’s important to choose the option that’s right for you. Bagging causes all the cut grass to be collected in a bag so that it can be deposited elsewhere. This process is also a bit time-consuming, as you will need to empty the bag when it’s full. EGO was founded in 1993 with the goal of making powerful and easy-to-use cordless technology for your yard. Their mission has been a success. Since founding, they’ve become one of the world’s largest tool manufacturers and can be found in 65 different countries. Worx’s mission is to push the boundaries of what is possible in helping people take care of their homes. They strive to make innovations so taking care of your home and yard is easier (and maybe even more fun) than ever before. Thanks for reading our guide on the best cordless electric lawnmower! When it comes down to it, the best option for you is going to be the one that suits your needs best. Ask yourself if you’ll be mowing in thick or tall grass, or whether your yard is on the larger side, or if you’re wanting to side discharge, mulch, or bag your grass. Our favorite option is the Snapper 19-Inch. It’s strong, it’s big, it has a lot of height adjustment options, and it allows you to side-discharge, mulch, or bag your grass to dispose of it as you wish. If you are looking for the lightest mower available or want the best budget option, we recommend the Worx 14-Inch. It’s not the best for big yards or for very thick grass, but it’s easy to push around, no problem to store, and your wallet won’t feel too much lighter after purchasing. Whatever option you prefer, the best cordless electric lawnmower can cut your grass just as well as a gas-powered mower for a lot fewer dollars.